I have two young boys and have had a nightmare of a time trying to explain to them how I earn a living, how I make money buying and selling shares of stock, and why anyone on Earth would actually take the time to read what I write about it. Every time I am typing on the computer, my youngest son thinks that I am playing a video game online. My oldest sees framed stock shares of famous companies on the wall in my office, but he doesn’t understand why they are there or what they really represent. I struggled to tell them. I did that is until I was given a copy of GiveAShare.com’s “I’m A Shareholder Kit” For Kids. While it is called a kit, it is a book geared towards teaching young people age seven to seventeen and older what stocks are, why we own them, and how and why they should be doing the same. The “I’m A Shareholder Kit” is a great first book for a child who wants to learn about stocks or for a parent who is clueless on how to teach the subject of stock ownership to their children. When the parent initially receives the kit, it recommends that you purchase a share of stock and of course they recommend that you buy that share from GiveAShare.com which includes a coupon for $10 inside the book. And, while this seems like a ploy at first, it really is the first step that any parent needs to take and the company sells the shares for a very reasonable price. And, GiveAShare.com has over 100 companies for your youngster to choose from. You need to have a physical share of stock and its accompanying annual reports and documents to reinforce the teaching points of the book. Like the book recommends, I let my son pick out a share of stock in a company that meant something to him. 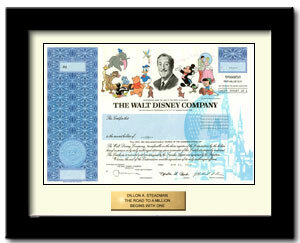 Like most seven year-olds, he chose to purchase a share of the Walt Disney Corporation. The stock certificate is beautiful, and you have a lot of framing options available from GiveAShare.com. It is definitely a work of art. After having the share of stock in his hands, it was much easier to begin explaining how he owned a piece (albeit a very, very small piece) of the company he loves. The best feature about this kit, or more accurately book, is that it has the most incredible graphics. The book walks parents and their young children step by step from the very basics of stock ownership, what is a certificate, why companies issue them, how they are bought and sold, what makes a stock a good value, and tons of other topics. And, then the book gets into more details for older children who want to delve into more details and a little more advance topics. The book really does cover a broad range of stock investing topics through incredibly entertaining pictures and clear, simple to understand text. The kit recommends that the parent initially let the child read at his or her own pace and to help when they have questions. My boys both loved thumbing through the pages learning about how a stock helps a company function and how people trade stocks in the secondary market for a profit (and sometimes a loss). This book was really a great place to start these necessary conversations with my young sons. If you want your children to understand how the stock market and stock ownership works, this is the book to start them off with. It was a great resource that I personally plan to go back to time and time again with my two boys when they continue to learn and have more and more questions. Overall, this kit is great. This book has incredible graphics and excellent content that is straight to the point. I would highly recommend it to anyone looking to tell teach their children about how stocks, buying shares in a publicly traded company, and the stock market work. Each stock mailing from your child’s company turns into a learning opportunity. 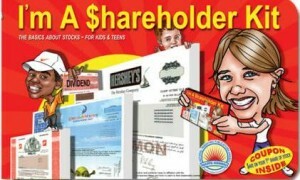 The I’m A Shareholder kit guides the young reader through the whole stock owning experience in a fun and engaging way.